Now that the month of November is here, the mounds of Halloween candy that children have stored in the pantry are probably starting to dwindle. But even though the candy is disappearing, Thanksgiving is just around the corner—a fun-filled day of family, friends, food, and lots of calorie-laden treats. While the Thanksgiving holiday is a time for family gatherings and celebrations, it can be an especially tough time for overweight or obese children who’ve developed more healthful eating habits throughout the year and have begun to lose weight. For them, all it may take is a few extra plates of food and desserts, and they’ll pack on some—if not all—of the unwanted pounds they’ve worked so hard to lose. Needless to say, childhood obesity is an epidemic of astronomical proportions in this country, and while much is being done at the federal and state levels to end its scourge, there’s much parents can do at home to reverse the trend—despite the inherent obstacles of the holiday season. According to Karin Testa, MS, RD, LDN, a pediatric dietitian at La Rabida Children’s Hospital in Chicago, an abundance of high-fat snacks and extra-large portions at holiday parties are two common pitfalls that can lead weight-conscious kids to gain back the pounds. A third pitfall: Children are home from school, which disrupts their normal schedules and routines. “During the holidays, school day routines are replaced with more freedom and increased time for sedentary activities,” says Sasson Moulavi, MD, medical director of SmartforLife.com. Children tend to sleep later, watch TV, and play video games for hours. “[Such disruptions] contribute to their lack of exercise and participation in organized sports activities,” he adds. 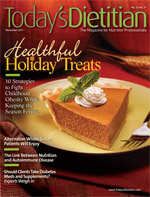 Lauren Cromer, MS, RD, LDN, an instructor at Middle Tennessee State University, says, “Children are no different from adults when it comes to overindulging during the holidays,” adding that unlike adults, most children don’t have the understanding of how choosing a sugar cookie over broccoli can lead to weight gain. Nonetheless, a season that brings the joys of family gatherings and gift giving doesn’t have to be a smorgasbord of high-fat, sugary cakes, cookies, pies, and candy. Following are 10 proven strategies for helping overweight and obese children navigate the season with a smile—but without the extra pounds. • Use either evaporated milk or chicken or vegetable broth as an alternative to cream in mashed potatoes. • Substitute wild rice, kasha, or quinoa as a healthier whole grain stuffing. • Use chopped nuts and dried fruit as stuffing extras. Sharon Richter, MS, RD, CDN, a dietitian in New York City, suggests parents trade fat- and sodium-laden chips for whole grain varieties. She recommends Kashi TLC Pita Crisps or Food Should Taste Good Multigrain chips. Many beverages are notorious for containing large amounts of sugar, so Testa advises that parents nix the punch and try a kid-friendly fruit spritzer that skimps on sugar but not flavor. “This is club soda with a dash—just enough to add some color—of 100% juice, such as pomegranate or grape, garnished with a cherry,” she says. While cutting out sweets entirely can make anyone a little grumpy (kids included), Crosby and Gorman recommend simple ingredient substitutions to allow kids to partake in the sweetness of the season. Because of the excitement surrounding the holidays, children’s eyes tend to be bigger than their bellies, “especially at family events when there’s food everywhere and everyone’s filling up their plates,” Testa says. Since children require fewer calories than adults, a typical meat portion for a child should be 1 to 2 oz, which is smaller than the 3-oz size recommended for adults. For younger children, Testa recommends parents serve the appropriate portions—and steer clear of seconds and thirds. “One filled plate, usually accompanied by appetizers and dessert, should be plenty,” she says. For holiday parties, she recommends a combination approach for all guests that involves using skim milk and half the butter for mashed potatoes and baking dishes instead of frying them, especially if the ingredients and cooking method aren’t essential to the dish. “But using half the butter in your family’s secret pie crust recipe isn’t going to be the same. In these cases, portion control is key. You want to enjoy your food and your traditions, so don’t compromise on that. But know that you must be especially mindful of portions of the high-calorie foods and enjoy every bite,” she says. Involving children of all ages in preparing a healthful meal takes the emphasis off calories and makes them feel “part of the celebration,” Crosby and Gorman say. Depending on the children’s age, you can ask for their input when developing the menu, encourage them to be shoppers’ assistants at the grocery store, or ask them to help you cook and set the table. Older kids can “set the table, clear the table, or play with younger children while the adults set up. These activities not only burn calories and help take the attention off of food, it also positions the child as a thoughtful, hard working person,” says Philadelphia-based dietitian and nutrition consultant Carol Meerschaert, MBA, RD. Scott A. Becker, MD, pediatric functional medicine specialist at Sanctuary Medical Aesthetic Center in Boca Raton, Fla., agrees, noting that holiday meals are the perfect time to involve youngsters in the preparation of a meal. “It’s during that time we create priceless memories of what the holidays are all about: family,” he says. Jackie Keller, founder of NutriFit, agrees that children love being Santa’s little kitchen helpers—and parents should love the lessons it teaches them. While Cromer says many schools have policies in place to limit unhealthy snacks, she advises parents to inquire about any special parties that may be planned and then discuss them with their child. “If an activity is planned where cupcakes and cookies will be served, involve your child in making a plan for healthful eating that day. Let them know how you would strategize, [saying,] ‘I would aim to have either two cookies or one cupcake vs. both,’ and then listen to the plan they suggest.” That way, children are much more likely to make healthful choices, since they were involved in the decision-making process, Cromer says. If parents have a normal weight and an overweight child within the family, they shouldn’t single out one child over another. Testa says allowing one child to eat a particular food while forbidding it to another is a recipe for disaster. “Talk to all the kids about having sensible portions,” she says. Moulavi says getting parents involved in the nutritional and physical well-being of their children is absolutely crucial, as they’re the true gatekeepers of their children’s healthful (or unhealthful) habits. In addition, parents should be active in their children’s school activities. Volunteering on party-planning committees, scheduling fun games that aren’t focused entirely on food, and providing healthier food choices are all great ways to get involved in school events. “Remember, it’s still a party and understand you’ll also be dealing with parents that may not be as nutrition conscious as you. It’s one day and probably just for one hour,” Moulavi says. So if a child happens to eat a few more bites of cake than usual, advise parents to take it in stride and make up for it later instead of making a scene. “At home, simply balance it out with healthful food choices and fun physical activities,” he says. Testa advises clients to speak with their child’s teacher about the foods that will be served at events. She recommends they volunteer to bring some healthful dishes so their child has more healthful options. Sarah Matheny, author of Peas and Thank You, has firsthand experience getting involved. She recommends her clients do the same to foster healthful habits not just for their child but classmates as well. Holidays that revolve around food can be challenging for any family, let alone those that have children with weight concerns. But to make healthful choices easier for children, Cromer says parents should ensure they’re acting as role models themselves. While Cromer recognizes the importance of food at family celebrations, she also believes the holidays should be about more than just food. “Taking time to plan other activities for the family will help get everyone out of the kitchen and away from the leftovers,” she says. Matheny says giving kids something nonfood related to look forward to can do wonders for children who may snack out of boredom if there’s sweets lying around and nothing else holding their attention. “Let them choose a holiday movie to watch after dinner or let them open one gift early. It’s not about bribery, but it’s about shifting the focus,” she says. In addition to conversing around a game of cards or a board game, she says renting a karaoke machine or a Wii, or even volunteering at a soup kitchen or shelter, can make for a richer holiday gathering. “These experiences will make far more lasting memories than any batch of gravy,” she says. Parents often skip meals to save calories for the big Thanksgiving day feast, but Testa says this isn’t a good idea for them or their children because it can lead to overeating during the big meal. “Family parties and holiday dinners can easily interrupt a child’s typical schedule, so make sure they have something to eat at their regularly scheduled meal and snack times. “If you’re having a big family dinner during their usual afternoon snack time, change lunch to something lighter, but never skip it entirely,” she recommends. Whipped cream and extra helpings of cake and ice cream are mainstays of holiday parties, but Testa says children are more vulnerable than most to these extra calories since they don’t require as many to begin with. “Since young kids don’t need as many calories as adults, they don’t have as much room for extras like whipped cream, gravy, etc. And even 100 extra calories a day over their requirements can send them soaring off the growth chart,” she says. “A good approach is to take out the extras when they aren’t necessary. For example, have the pie without the ice cream, the hot chocolate without the whipped cream; make the sweet potatoes without the marshmallows, and the green beans without the cream soup and onion strings,” she suggests. Whether you have a toddler or a teen, Moulavi says parents should instill healthful eating practices throughout the year, not just during the holiday season. Having regular family meals, serving a variety of healthful foods and snacks, and not using food as a punishment, bribe, or reward are strategies he says should be used year-round. 1. Ogden CL, Carroll MD, Curtin LR, McDowell MA, Tabak CJ, Flegal KM. Prevalence of overweight and obesity in the United States, 1999-2004. JAMA. 2006;295(13):1549-1555. Seventeen-year-old Reed Alexander, who portrays Nevel Papperman on Nickelodeon’s TV show iCarly, knows what kid-friendly foods look like. After adopting healthful eating habits for himself, he created an interactive website called KewlBites.com to give other kids ideas on how to eat for health and taste. 1. Preheat oven to 350˚F. Line two large baking sheets with parchment paper. Set aside. 3. Meanwhile, in a large mixing bowl, combine the sugar, egg whites, oil, yogurt, and vanilla extract. 4. Once the chocolate in the double boiler has melted, carefully remove the bowl from the saucepan and pour the chocolate into the larger bowl containing the ingredients mixed in Step #3 (see above). Stir until thoroughly combined. 5. In a separate, smaller mixing bowl combine the dry ingredients—flour, baking powder, and salt. 6. Add the dry ingredients to the liquid combination of ingredients in the larger mixing bowl, and combine with a spatula or wooden spoon until completely smooth, being careful not to over mix. 7. Drop 36 individual rounded tablespoons of batter onto the prepared baking sheets, leaving about 11/2 inches of space in between each. Each tablespoon will yield one cookie. 8. Bake on center rack in the oven for approximately 10 to 12 minutes, or until cooked through but still tender in the center. 9. Remove from the oven and allow to cool on wire racks. During the holidays, invite pint-sized guests to prepare their own banana smile for a treat sure to rate high on the health and fun meter. Place banana, with peel on, flat on its side on a microwave-safe plate. Starting and ending 1/4-inch from the ends of the banana, cut a slit lengthwise through the banana up to the skin on the other side. Gently open the banana. Use your fingers to stuff the banana with raisins then add chocolate chips. Microwave banana uncovered on high for 40 to 60 seconds or until chocolate begins to melt and banana is still firm. Banana skin may darken slightly. Eat immediately, scooping with a spoon right out of the banana peel.